The Teaching Portfolio is a reflective opportunity for faculty to organize, question and challenge themselves as educators. This self-reflection helps to articulate teaching philosophies, identify ways to continuously improve teaching methodologies, and maintain balance and create synergies between teaching, scholarship and service. 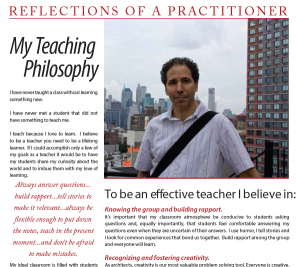 City Tech faculty are encouraged to reflect on their teaching at key moments over the term. They are invited to participate in a workshop guided experience to organize their course content and student responses, challenge their assumptions about teaching and learning, use assessment to identify ways to improve teaching methodologies, stay current in their discipline/profession, and articulate their teaching philosophies. The following two examples are online and are geared towards portfolios that focus on disciplines that rely on graphic works. The first by Prof. Spevack follows the traditional word format on a website. The second by Prof. Montgomery uses a more flexible format. 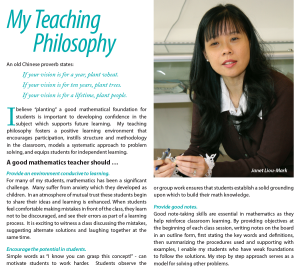 Click image or here to view Teaching Philosophy. View how faculty integrate their teaching portfolio in their PARSE. It provides a framework so the teaching Portfolio becomes clear. Its been useful in leading me to think reflectively and critically about my teaching methods. I appreciated the personal attention by the instructors, the book provided and the time given to write. The amount of work I got done. By the second day it really started sinking in and I was able to write up a good draft. Being able to get feedback from people outside of my discipline was very productive.